Ever since I had my first authentic meal in a home turned resto, I automatically fell in love with Korean cuisine. I still clearly remember cooking and eating Samsyugsal and slurping a bubbling spicy pot of Kimchi Jigae in Top Dish. My love and curiosity grew even more whenever I see how Koreans eat, they eat with so much gusto and fondness. I've eaten in a lot of great Korean restos here but nothing can compare to what we tasted and experienced in Seoul. We arrived very early in the morning. It was so cold and we were hungry. We stopped by the first resto we saw that was serving hot food. It was a great choice since we got to taste three popular Korean street food in our first meal. Ddoekbokki is spicy rice cake. It consists of bite size pieces tube-shaped sticky rice doused with a spicy, slightly sweet ,sour and salty sauce topped with slices of fish cake, spring onions and sesame seed. The sticky rice itself was bland but the sauce packs a heat of different flavors. Odeng is skewered fish cake. It is a ground up fish mix with flour, starch and different spices. Usually the fish cakes are boiled in a turnip, onion leeks and seaweed base broth. The broth is then serve as soup to accompany the odeng. We enjoyed munching on the Odeng, we can actually taste the fish more than the starch and flour. The soup was simple and hearty, perfect for the cold weather. Kimbap literally means seaweed rice. Looks like Sushi right? But to my surprise it didn't even taste like one. There are different versions of the Kimbap, the one that we ate had carrots, pickled turnip, egg, cucumber and fish cake. I think the main difference between sushi and kimbap is in the cooked rice, the Koreans don't add vinegar to the cooked rice while the Japanese do. It's simple, tasty and it's a great quick bite since it's so easy to pop a piece in your mouth anytime, anywhere. After visiting Cheong Wa Dae, we had lunch at a random resto that we found near the grand palace area. There were two dining areas, people can choose to sit on chairs or sit on mats on the wooden floor. We chose the latter since the wooden floor provided the warmth that we badly needed. As soon as we sat down, a pitcher of water was placed in front of us. It's something that we experienced in every placed we ate. The common cutlery consists of a long spoon, metal chopsticks, small flat bowl and a stainless drinking cup. It was cold so we ordered something warm that we can sip and slurp. The Seolleontang is a soup made up of beef bones and brisket that was cooked and simmered for hours. The soup had a surprisingly milky white appearance. When I took a sip, my first impression was it tasted so bland and flavorless, how can something cooked for so long taste flat. Too bad, its only after our trip that I found out that this soup was supposed to be seasoned by the diners themselves. It's the reason why there was a bowl of salt and pepper beside the dish. Well, now I know. Kimchi Jigae is kimchi stew. The bubbling pot of spicy red stew was delicious and full of flavor. It had chunks tofu, bean sprouts, potatoes, beef slices and of course kimchi. The layers of flavor was incredible, at first sip, I tasted sour and salty then the subtle sweetness then the umami taste and lastly the spiciness kicks in. It was like a celebration was going on inside my mouth. A Must Try! It is customary in Korean meals to be served with different side dishes. The free side dishes varies from one place to another but kimchi is a staple. Kimchi is the national dish of Korea. It is fermented vegetables, the most common vegetable used in making Kimshi is Napa Cabbage. Koreans eat this in every meal they have. I've got so addicted to the sour, salty, spicy side dish during our trip. Bap or rice is served in a stainless flat bowl and the general rule is, you use the long spoon to scoop the rice out. Lifting the rice bowl off the table can be frowned upon so make sure you don't eat rice like the Chinese and Japanese. 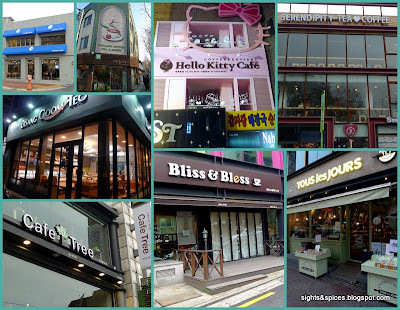 After watching Nanta in Myeongdong, we looked around the different food stands on the street. We spotted a long line at what looked like a Shawarma stand. On the Shawarma Grill was chicken, the table was laid out with flatbread topped with chopped chicken, chopped onions and cabbage topped with what looked like mayonnaise and a reddish-orange sauce that we were not familiar at that time. The Chicken Wrap tasted beyond our expectation, the chicken was tender and moist and it had that distinct Korean flavor that came from the reddish-orange sauce. On the next stall, we saw an elderly couple preparing different classic Korean food. We ordered a plate of Mandu and Pajeon. Mandu is korean dumpling. It looked like regular Chinese dumplings but the flavor was totally different. The pan-fried pork dumplings had that distinct Korean flavor which tasted like the reddish-orange sauce we tasted in the chicken wrap. The dumplings were so good and addicting, we wolfed down the whole plate in seconds. Pajeon is spring onion pancake. The savory thin Pajeon is similar to the Chinese scallion pancake. The basic ingredients of the pancake consists of egg, flour and spring onions. Very simple but tasty. The next day after checking out Changdeokgung Palace and Huwon Garden, we ate at a resto nearby. Since the resto is near a tourist spot, there was an English menu.We started our meal with a bowl of Bibimbap. Bibimbap means mixed meal, it is a bowl of rice served with different vegetables, eggs and chili pepper paste.Some versions contains meat and a raw egg, the one we ate just had vegetables ans a sunny side egg. The right way to eat this beautiful looking dish was to mix everything up. The Bibimbap tasted hearty and fresh, all the different vegetables were still crunchy. And the chili pepper paste added the wonderful spicy flavor to the dish. Samgyupsal is grilled meat and it is usually wrapped in a piece of lettuce before eating. I was expecting to do some grilling but since the resto caters to tourist the pork belly was already cooked. The platter of meat consists of a block of tofu, pickled crunchy vegetable which I'm not familiar with and kimchi. A basket of lettuce leaves and two dipping sauce completed the set. The first sauce was sesame oil with salt, pepper and onions and the second sauce is Doenjang. Doenjang is fermented bean paste, salty, sweet and slightly acidic. This was the reddish-orange mysterious sauce that gives that distinct Korean flavor. This resto served more side dishes than where we dined before. Bean sprouts drizzled with sesame oil, coleslaw, dried anchovies, a piece of mackerel, spinach and kimchi. After eating lunch, we went out the street and smelled something wonderful coming from a street stall selling Hoddeok. Hoddeok is flat bread made on top of a iron griddle, it's filled with sugar, honey, cinnamon and chopped peanuts. Available everywhere, I got addicted with this treat that I lost count on how many pieces I ate during the whole trip. Insadong has a lot of tea stores and cafes, we decided to drink some tea in one of the tea saloons. Since I felt that I was about to have a cold, I chose a tea with a description of 'for health recovery'. I can't remember what the tea was called. To my surprise, a big bowl of black liquid with little white things floating on it was served, I have no clue what it was. This was very new to me, I expected a tea pot and tea cups but a bowl with a soup spoon?!? The tea was served with Sweet Rice Puffs. As I took a whiff and sip, it reminded me of the boiled assorted 'you don't want to know' herbs and things Chinese medicine. It tasted bitter, earthy, nutty, sweet and salty. I'm not a big fan of this but I did finish the whole thing. The next day my colds were gone and I felt great so it must have been the tea. We stopped by at a Kultarae stall to watch how they make these sweet Korean court cakes. They start off with a whole block of honey syrup, they fold and pull the mixture over and over again until it becomes hair-thin strands. The process was like making noodles. They placed a sweet nut filling inside. Lastly, they roll the thin honey strands with a thong to encase the sweet nut filling inside. The result was an interesting sweet tasting candy, I thoroughly enjoyed the soft-stringy feeling inside my mouth. While watching, we chatted with an American who owns and runs a bee farm. He was just as amazed as us because he told us that he has never seen honey made like this. Travel tip: Best eaten right on the spot. Don't even think of bringing Kultarae as pasalubong or gifts, the candy will just melt. After a stroll at Insadong, we headed to Namdaemun Market for dinner. On the middle of the street, there were makeshift tents that serve as an eating and drinking place. When we entered, a gorgeous food spread greeted us. There was also fridge filled with Korean alcoholic beverage, Makgeolli and Soju. Makgeolli is fermented rice and wheat that has an off white color. I've tried and tasted Makgeolli before and I prefer Soju over it. We ordered a bottle of Soju, to our surprise the couple who runs the tents told us that the bottle of Soju was free. Soju is made of rice, it's slightly sweet and the taste is similar to good tasting Vodka.What I liked about Soju is that it doesn't feel heavy when you drink it and it only takes a few shots to make you giddy happy. And as Anthony Bourdain has said, this stuff is highly addictive. Chap Jae is stir fried sweet potato noodles in sesame oil mixed with various vegetables. I've eaten quite a few versions of this noodle dish back here but the one we ate there was much tastier and the noodles were firmer. Sanakjji is raw octopus. Ever since I saw Anthony Bourdain and Andrew Zimmern eating this, I vowed to try it myself. What makes this interesting is that you eat the octopus' tentacles while its still squirming and moving. And if you are wondering, yes, the suction cup from the tentacles still works and it does get stuck in your mouth. When I told Jon about eating Sannakji, he told me he wouldn't try it but when he saw how much I was enjoying eating it. He gave it a pop and then after we both finished the little pieces of tentacles. The tentacles was doused with light soy, sesame oil and topped with sesame seeds and leeks. The tentacles was surprisingly not fishy at all though it was really slimy. This was truly a food experience that I'll never forget. Namdaemun is also a popular place to have Kalguksu. We went inside a small resto that serves the Korean handmade wheat noodle soup. There were different soup choices, we chose the Clams version. The irregularly shaped thick noodles was nice and firm, it still had a bite into it. The broth had fresh clams, leeks and ginger, so simple yet so hearty. We also ordered a plate of Mandu, this time around the steam dumplings was shaped into beautiful circular shapes. This were far more tastier than the one we had in Myeongdong, this was due to the Kimchi that was added to the pork filling. The next day, after checking out the N Seoul Tower and Teddy Bear Museum, we ate at one of the restos found in the area. The Oriental Roo serves different Asian dishes. Jajangmyeon is black soy bean noodles. It's basically wheat noodles topped with Chunjang or Black Soy Bean Paste with diced meat. The noodle dish was savory, the combination of the sweet and salty flavors hits the spot. We also ordered Yang Chow, the fried rices tasted just ok. This was the single non-Korean dish we ate for the whole trip. In the Hogdae area, we got to try a lot of street food from the bountiful food stalls found in the area. We started with the Chicken Barbecue. Nice and savory but not as flavorful compared to the Chicken barbecue here. On the next stall I found some Korean sausages. Sundae (pronounced as soon-day) is blood sausage. The sausage casing came from the pig's intestine stuffed with vermicelli noodles, barley and pork blood. I don't like the malansa or 'fishy pungent' smell and taste of blood but the sausage didn't taste like blood at all. It had a mellow nutty flavor. It is served with different pork innards and it came with a salt and pepper dip. We saw people carrying cups with what looks like fried chicken. We got ourselves a cup each, one with honey mustard dressing and another with a sweet and spicy Gochujjang paste. The fried bite-size pieces of chicken was crunchy and tender.Our favorite was the one doused with Gochujjang or hot pepper paste. Lastly, we found a food stall where there was a long queue, they were selling hamburgers in hotdog buns. Two rectangular beef patties enveloped in a soft bun topped with chopped cabbage, doused with Teriyaki sauce and mayonnaise. For its price, the burger was really good and worth the price. Naengmyeong means cold noodles. The noodle dish we had was served in a large stainless bowl that consists thin long handmade noodles with a spicy tangy iced broth topped with sliced fish, polonchay, radish, sliced cucumbers and a hard boiled egg. The contrast between cold and hot was so fascinating, though the whole dish was cold I can still feel the heat that was coming from the spicy broth. Bulgogi which literally means fire meat. Marinated thin slice of beef are cooked on an iron griddle mixed with garlic, onions, sesame oil, sugar and soy sauce topped with sesame seeds. The beef was so tender, it tasted sweet, a little sour and I can taste the nutty aroma flavor that came from the sesame oil and seeds. It was so good, savory and hearty. One of the must try in South Korea! Bulgogi Jungol is beef stew. Usually they used leftover beef from the Bulgogi to turn it into a stew or soup dish. Big slices of onions and different vegetables are added. Just like the Bulgogi, the broth's flavor was similar to the grilled beef. The soup dish was savory and very comforting. Important Note: In eating in food courts. After eating, make sure to return the tray with the bowls to the respective food stalls you got the food from. After visiting Lotte World, we were undecided where to have dinner. When we passed by a row of restaurants serving Samgyupsal, we decided to give it another try. This time around we made sure that we'll be able to experience how the locals eat Samguypsal. We decided to order beef instead of the usual pork belly. Just looking at the beef, I knew that it was of high quality, the marbling of the meat looks beautiful. As soon as we order, the owner went out of the store to get a cauldron of charcoal to put inside the grill which was built-in the table. There were a lot of components that was served that wasn't present in out first Samgyupsal meal. Aside from the lettuce leaves and the two dipping sauces, there was whole cloves of garlic, green bell peppers and Pa Munchin. Pa Munchin is green onion salad, the green onion were sliced lengthwise and chili powder was added. This is how you eat Samgyupsal: Grill the meat, garlic and bell peppers. Get a piece of lettuce then get a piece meat and dip in the sauces. Place the meat on top of lead and proceed to add the garlic, bell pepper and Pa Munchin. Fold or roll and take a big bite. Another must try! The next morning, before heading to Noryangjin Market, we stopped by Kong's Rice Ball to have breakfast. A ball of rice stuffed with a food dish of your choice then covered with strips of dried seaweed. We chose the bulgogi and kimchi filling. The simple rice balls tasted yummy. 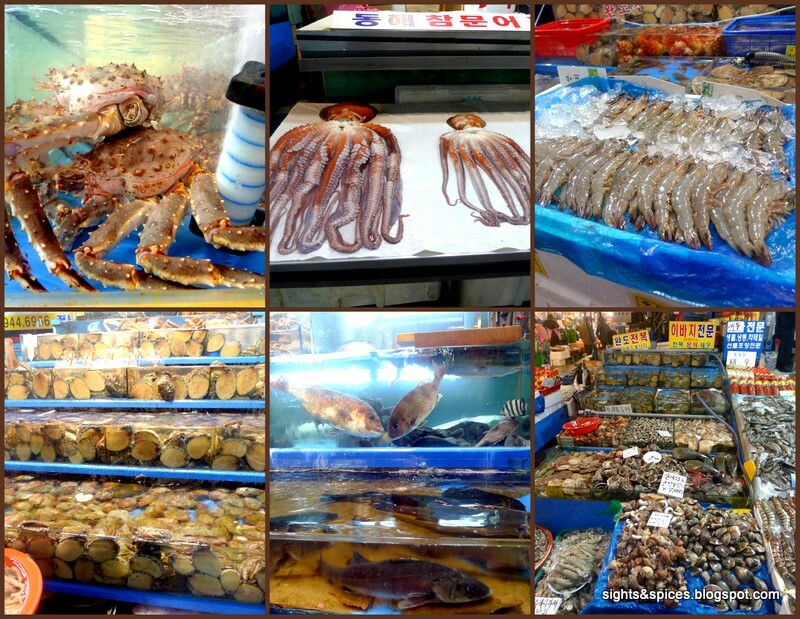 The Noryangjin Market is filled with stalls selling live sea creatures, some looked familiar some were not. This place is known for purchasing fresh seafood and having it cooked at the restaurants nearby. We were here to have the freshest fish sashimi we'll ever have, Koreans call it Hwee. After agreeing at a price, the vendor proceeds to slaughter the fish. He hands the fish to the Hwee master slicer, the master slicer carves the fish and lays the pieces of raw fish on a plate. The remaining fish bones was put in a plastic bag. Together with the plate of Hwee and plastic bag of fish bones, we were lead to a restaurant. On our table was the freshly cut slices of fish, lettuce leaf, wasabi, Gochujjang, slices of okra and cloves of garlic. The fish sashimi tasted so fresh and sweet, we had fun alternately eating it the Japanese way and the Korean Way. The fish bones were brought into the kitchen to be made into Maeuntang. Maeuntang is spicy fish soup. It is made using Gochujjang and chili powder with different vegetables. The spicy fish soup was one of the most heart-warming and unforgettable fish soup that I've ever tasted. The big pot can feed four people and both of us finished everything til the last drop, that's how good the soup was. Must Try! Travel Tip: Majority of the vendors at Noryangjin Market doesn't understand English. Try to know the fair market price of the fish before haggling. Better yet, go with a local so he'd be able to haggle for you. We ended up paying KRW 75K for the fish because of miscommunication. We fell in the tourist trap. When we were in Itaewon, we went to Mcdonalds to check if they serve something which can only be found in Korea. What we found was the Bulgogi Burger. The beef pattie tasted sweet and was topped with chopped cabbage, nothing really special. As our last full meal, we concluded our food adventure in Two Two Chicken. Yangnyeom Dak or Korean Fried Chicken has been growing its popularity recently. To those who are not in the know what made this crunchy chicken treat unique and special is Korean Fried Chicken are deep fried twice. This process renders the skin to be extra crunchy and makes the meat more moist and tender. We ordered two kinds of fried chicken, the regular variety and the one smothered with a sweet and spicy sauce. As soon as we took our first bite, we instantly knew why the fried chicken is gaining popularity. The skin was indeed so crunchy and the meat was so moist and tender. It was so addicting, we ate one piece after the other. The sweet and spicy version tasted like a sweet Gochujjang, I like this more because the hotter it is the better it is to me. And even though the fried chicken was doused with the sauce, the skin remains really crunchy. So good! Both dishes has a side of chopped cabbage with ketchup and mayonnaise on top. We were also served a plate of pickled daikon, the daikon served as the palette cleanser from all the grease. While walking around Seoul, we noticed the abundance of Cafes and Bakeshops in the streets. The Cafes and Bakeshops would usually be filled with people in the morning. I asked one of the locals if this was really how they eat their breakfast. He told me traditionally, Koreans would really have a sit down meal together with the whole family, usually the family would have a light tofu stew, rice and side dishes for breakfast. But nowadays because Korea has become a fast paced country, people would grab coffee and bread and eat it while walking and commuting. We got to try coffee and some bread in one of the more known cafe-bakeshop, Paris Baguette. There was an assortment of breads to choose from and what caught my attention are the gorgeous looking cakes. Before I could have taken more pictures of the cake, an employee approached me and told me to delete the pictures. I guess that's how competitive the cake business is in South Korea. We got a loaf of Garlic Bread and a Cream Filled Pastry. Both tasted good, nothing really to rave about. For our coffee, we ordered a cup of Americano. I have no clue whatsoever from what region the beans comes from. After having coffee at The Coffee Prince and Paris Baguetee, I notice how weak and pale Koreans prepare their coffee. The aroma was there, it smelled great but it lacked the stong and bold flavor I wanted. Looking at some of the Korean dishes, I initially thought Korean cuisine would taste like Chines and Japanese food. But I was wrong, though there are similarities, Korean cuisine has its own distinct flavor and identity. Most people would associate Korean cuisine to being spicy, this is partly true because of it's generally cold climate. When the weather is cold, one would want to eat something comforting and heartwarming, something that soothes the body and soul. And this is what I experienced and felt from every bite and sip that I took from the wonderfully delicious and soulful food. I've always said that Chinese food is my comfort food but now I definitely have to add Korean food as one too. "Massida!!!" Travel Tip: Most of the restaurants doesn't carry an English menu, try to list down the names of the dishes beforehand. But you can always point at what looks good and not worry, Koreans prepare great tasting meals.